The U.S. Army Aviation and Missile Command (AMCOM) Research, Development and Engineering Center (RDEC), with support from industry, conducted an Advanced Technology Demonstration (ATD) to design, fabricate, and flight test a low cost guidance and control (G&C) package for the Extended Range MLRS rocket. 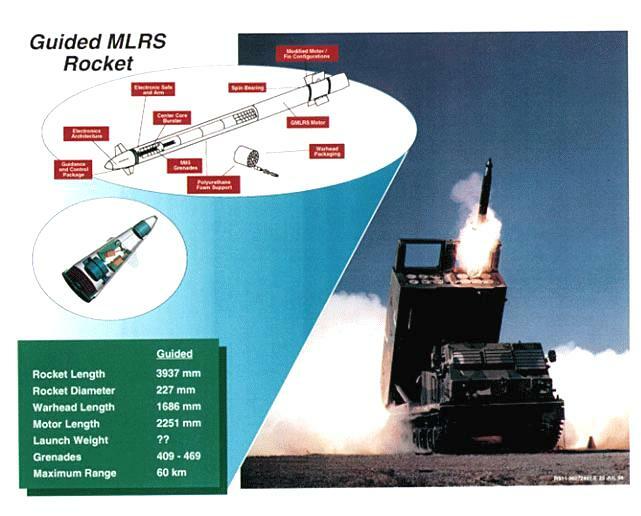 In 1994, the Missile Research, Development, and Engineering Center (MRDEC) initiated the Guided MLRS Advanced Technology Demonstration (ATD) with the support of the MLRS Project Office and the TRADOC System Manager for Rockets and Missiles. From the start, the ATD's exit criteria included not only accuracy improvements, but also a production cost goal of $12k for the guidance and control package, a zero maintenance requirement for the rocket, and a shelf-life of at least 15 years. The design, fabrication, and testing of the guidance and control package took place within the MRDEC. The thermal battery, IMU, and GPS receiver were purchased off-the-shelf and tested by the MRDEC. The control actuation system, guidance computer, and all missile software were designed in-house by the MRDEC. The GPS antennas were designed and fabricated by the Army Research Laboratory. The canards, spring-opening tailfin assembly, telemetry package, roll bearing, missile skin sections, and wiring harnesses were designed and fabricated by LMVS. The MRDEC assembled the rocket and performed all system testing. The Guided Multiple Launch Rocket System (MLRS) Advanced Technology Demonstration [ATD 95-98] demonstrated a significant improvement in the range and accuracy of the MLRS free-flight artillery rocket. Improved accuracy results in a significant reduction in the number of rockets required to defeat the target (as much as sixfold at extended ranges). Other benefits include an associated reduction in the logistics burden (transportation of rockets), reduced chances of collateral damage and fratricide, reduced mission times (resulting in increased system survivability), and increased effective range for the MLRS rocket. The ATD designed, fabricated, and flight-tested a low cost guidance and control package to be housed in the nose of the rocket, thus minimizing the changes to the current rocket. The Phase I G&C package, consisting of alow cost inertial measurement unit (IMU), a flight computer, and canards driven by electro-mechanical actuators, were housed in the nose section of the rocket and will result in a significant increase in rocket delivery accuracy. The IMU package provided a 2­3 mil accuracy sufficient for some MLRS warheads with the GPS-aided package providing a 10 meter CEP accuracy for warheads which require precision accuracy. The package demonstrated resulted in a rocket which is more cost effective and more lethal while requiring no change to crew training procedures or maintenance procedures (during the 15-year shelf-life). The guidance and control package were designed with applicability to bomblet, mine, precision guided submunition, and unitary/earth penetrator warheads. On May 13, 1998, a fully successful first flight of the Guided MLRS was conducted at White Sands Missile Range, New Mexico. This flight was launched from an M270 launcher, flown to a range of 49 km, demonstrated the proper operation of all missile subsystems, and achieved the 3-mil accuracy (150 meters at 49 km) goal when navigating in pure inertial mode using a Honeywell HG1700 IMU. Given the level of success on the first flight, the second flight was changed from an inertial flight to a GPS-aided flight. However, due to a bug in the vendor's GPS receiver software, only three satellites were tracked and the missile again flew a successful inertial flight using a Honeywell IMU. The third flight was conducted with the Litton LN-200 IMU. All subsystems performed well except for the IMU, which did not meet the accuracy goal. The fourth flight experienced a catastrophic tailfin failure at launch as well as an electrical short in the umbilical. After a root cause failure analysis and further tailfin testing, an adjustment was made to the tailfin assembly and a blocking diode was added to prevent umbilical shorts from damaging the rocket's electronics. The ATD culminated on February 11, 1999 with a GPS-aided flight test in which the missile again flew 49 km and impacted only 2.1 meters from the target center, a resounding success.